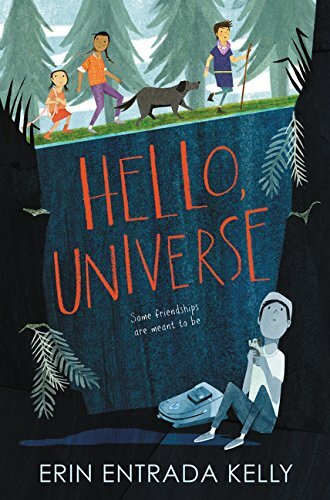 Four sixth graders come together in a serendipitous turn of events in this year’s Newbery award winner, Hello, Universe. Hello, Universe by Erin Entrada Kelly. Greenwillow, 2017. 320 pages. Virgil hates that his parents call him “Turtle,” but the nickname does kinda fit: his shyness keeps him quiet around everyone save his beloved grandmother (because she understands him and does not call him Turtle). Virgil is also Kaori’s one and only client; she’s just started her psychic business and is alert to every hint from the spirit world. Valencia, who is deaf, stumbles upon Kaori’s business card at the grocery store, and she desperately makes an appointment. Valencia, outwardly self-composed and fearless, is just as lonely as Virgil is. Kaori, Valencia, and Virgil come together in a serendipitous string of events triggered by local bully, Chet, and his casual toss of an innocent-looking backpack down an old well. 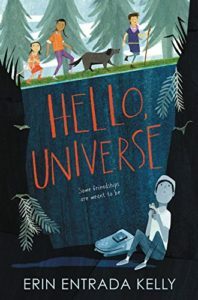 Hello, Universe is a product of its times: lots of cultural/ethnic/physical diversity, lots of distinct personality traits, and lots of “thank you’s” to a vague universe that seems to be orchestrating events. Nearly every middle schooler will resonate with some part of these characters and their strong personalities. Strong friendship themes land this book firmly in the classic middle grades genre, although it would be nice to have more resolution with the bully (who is also lonely and struggling). But it doesn’t “sing” and lacks the staying power of many previous Newbery award winners (it garnered this year–2018’s–Newbery award). Of course, that is this reviewer’s opinion, and the Newbery committee no doubt had many discussions about the many worthy titles they were considering! Cautions: Readers should be advised that there is frequent mention of the spirits and a vague universe as a higher power. Kaori’s psychic abilities, however, are presented somewhat as a middle schooler’s imaginative persona with several nods to more likely explanations cropping up. Still, this sort of gratitude to an unnamed higher power is growing increasingly common in our society, and it would be worth discussing with your young reader if they pick this book up.